Lotto Land is where hobos go to participate in other hobo's lotteries to win Cash, Points, Tokens, and/or Donator Packs. 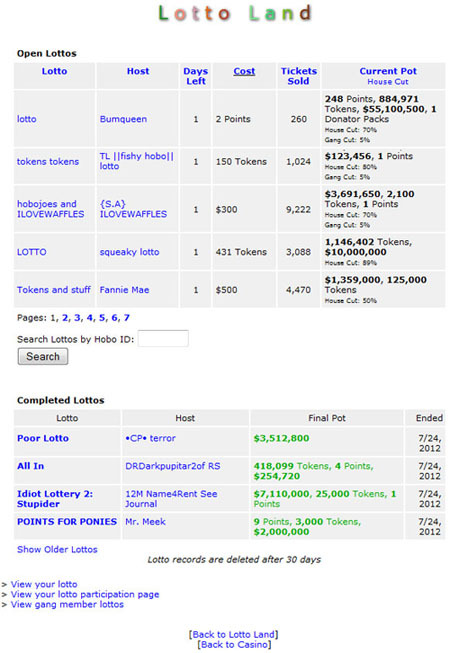 You can create and manage your own lotto from here as well. You can purchase tickets up to the lotto host's limit up to a maximum of 1000 tickets. Tickets are bought using Tokens, Points, or Cash. You cannot buy tickets to your own lotto. You may also donate Tokens, Points, Cash, and/or Donator Packs to any lotto, including your own. Includes tickets you have bought, your donations to any lotto, lottos you have won, and results from your completed lottos. Time left in the lotto. Donations will be disabled with less than 24 hours left in the lotto. 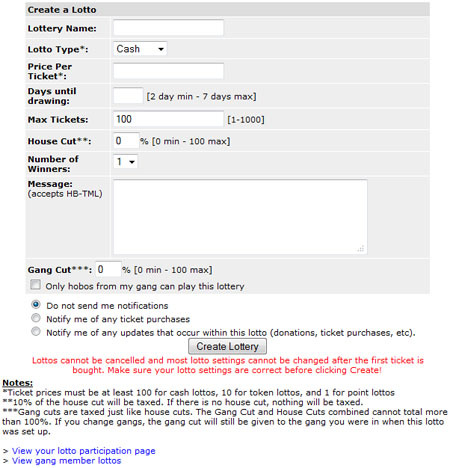 Purchasing tickets will be disabled with less than 5 minutes in the lotto. Amount of tickets held by yourself. Maximum amount of tickets one can buy. How many hobos are participating and total amount of tickets sold. View who has bought tickets to this lotto. View who has donated to this lotto. Here you can create your own lotto. You are only allowed one lotto at a time. The day advances at 1:05 PM HoboWars time. This page was last modified on 17 October 2012, at 14:07.